July is a busy month in San Diego, with the All-Star Game, San Diego Pride, Comic-Con and Over the Line championships all taking place, but there is also another unique event that should pique the interest of Downtown residents. The third annual “Yoga on the USS Midway — Superhero Edition” will be free and open to the public, just in time for Comic-Con. The class, called “Stretch Yourself with Scripps” and co-hosted by Scripps Health and Downtown San Diego Partnership (DSDP), will take place at 8 a.m. on Saturday, July 16, on the four-acre surface of the retired aircraft carrier. Participants are encouraged to dress as their favorite comic book characters for the superhero-themed event that will kick off Comic-Con in San Diego. The free yoga session is a part of a greater Scripps program called “Healthy Living in the City,” which encourages wholesome lifestyle options for San Diegans who live and visit Downtown. This year’s “Stretch Yourself with Scripps” event is the biggest to date: More than 1,000 participants have already registered. Last year’s event saw more than 700 yoga enthusiasts flock to the waterfront museum. “Being on the historic flight deck that carried 225 sailors over 47 years and is a floating museum is really a unique experience,” Michell said. Instructors for the one-hour yoga session on the Midway’s flight deck come from Yoga One, a popular Downtown yoga studio on Seventh Avenue. A number of vendors and other representatives will also be on hand, distributing information and conducting special giveaways, including doctors from Scripps Health, West Bean Coffee Roasters, Lululemon Athletica, Essentia Water, SolCal Café, and Kind Bar. Live music for the event will be performed by Dave Kemp. 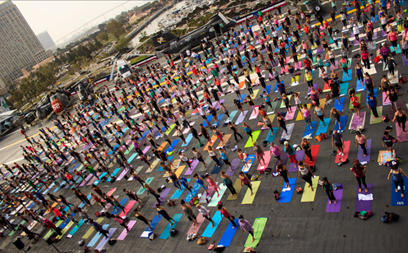 For more information or to register for Yoga on the USS Midway, visit tinyurl.com/z85d8pm. Follow the event on social media #ScrippsHealthyCity. —Tori Hahn is a local freelance writer. Reach her at torihahn@cox.net.